A The Kidney stones are the most common complaints and one of the most potential painful conditions of our body. Even though medical sciences advanced from open surgery to non invasive procedure (ESWL), their scope is limited to administration of Medicines. It's our privilege that Homoeopathy could render a great service in the treatment of renal calculi by dissolving the stones, expelling them in a short span of time and also preventing the further recurrences of this painful condition. 3. Eliminating the tendency for recurrences. Mostly the patient chooses modern medicines for acute pain in the abdomen and in most cases are incidental finding, after an imaging study. The pain always denotes the travel of the gravel in the ureteric pathway. The intensity of pain varies with size, place and the characteristics of a stone. Pain with yellow, brown coloured urine would give a sign of internal injury which is very common in oxalate stones. Rarely homoeopaths are approached for acute colic and it would be an easier task to diagnose with typical characteristics of pain and confirming them with an imaging study. Acute pain management also possible with the most potential remedies like Aconite, Belladonna, Colocynth, Nux Vomica etc ,depending on the similarity of the symptoms. When the patients are free from pain and the stones are “Silent” use of these specifics, mostly in Mother Tincture form would accelerate the recovery by dissolving and discharging. I have seen many cases, after few days of treatment; bring the stone with a surprise. I have collected such stones in a great integer. Most of the cases with the size of 4mm to 10 mm can be voided; in my experience a robust person had voided out a stone of 1.8 cm in size. Other lifestyle modifications like increasing fluid intake (10-12 glasses of water) and a well regulated diet is the first step in prevention of stones. More than 80% of those affected with Kidney stones experience a recurrence. Men are affected approximately 4 times more often than women. People who have already had more than one kidney stone are prone to develop more stones. 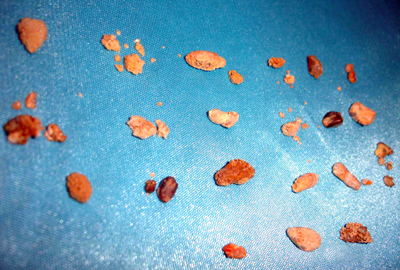 A family history of kidney stones is also a risk factor for the development of kidney stones. But with Homoeopathic medicines recurrence rate is very less. It is observed in a study of renal calculus patients over a period of 10 years proved that the recurrence rate is very less. · Drink at least 3 litres of water every day, more in hot weather. Coconut Water, Pineapple juice, Lemon, Horse Grams are useful. · Avoid or eat sparingly food containing calcium oxalate (spinach, tomatoes, grapefruit juice, apple juice, nuts, soya bean, chocolate, beans, beets, soda, and all types of teas and berries). · Reduce uric acid by eating a low-protein diet. · Reduce salt and higher amounts may raise the level of calcium oxalate in urine. · Our treatment protocol stresses on a preventive line of treatment as well as improving your chances of passing out stones through diet and Homoeopathic medicines. You can prevent and reduce your chances of stone recurrence with the lifestyle changes and Homoeopathic treatment recommended. Achieving a stone free state is important in the management of renal calculus. However it is becoming clear that the use of metabolic measures to prevent stone recurrence is of equal importance. It is now possible to identify and correct the underlying predisposing factors for stone formation in the majority of cases after careful initial investigation. An absolute chance of total and easy recovery is possible with the proper application of Homoeopathic medicines and the recurrence chance is minimized to very less. This is proved in time to time and this is perhaps an area where more work and research is required and we should expose the efficacy of Homoeopathy in this field by proving the results with proper documentation to the medical fraternity.